Fly fishing on Colorado's famous river can result in 30 rainbows per day! "Keep your rod tip high," my guide laughed as I stumbled backward on the rocks after my hook set. 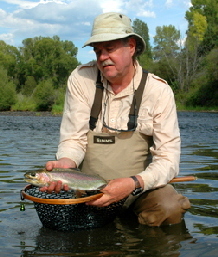 With the sweep of the rod, I had 20 inches of rainbow heading downstream to the next pool. "Don't put too much pressure on the fish," he coached. "That's a bigger fish than the last one." I reveled in the thought that this trout might be larger than a couple that I had taken a few minutes before. They were between 16 and 17 inches, and to me, nice size trout. The battle with the big one, like my fly casting form, may not have been pretty, but I managed to enjoy the tussle for about 5 minutes. The stubborn trout jumped 3 or 4 times and ran in and out of the current another five times as I hung on. Guide Todd Brown offered me verbal support and then readied his landing net when the tired fish surfaced in the shallow flats. He waded toward the fish, as I moved the trout toward him with the appropriate directional pull of my 9-foot rod. The Colorado River had yielded four fun trout in about 2 1/2 hours that warm August afternoon. It was a lazy day where the primary bite, naturally, had occurred in the morning hours , long before I was able to join up with Brown for a taste of the fly fishing in Grand County, Colorado. While high afternoon temps make fish lethargic and some anglers sleepy, it was the only time I had to sample the fishing. Fortunately, the trout cooperated and thanks to the guide, I was amply rewarded for my efforts. Brown has been guiding fly fishermen on the Colorado River for more than 11 years, so he can find active fish in normally "inactive" times. He uses his intimate knowledge of trout habitat, entomology, presentation and approaches to not only guide the angler to a worthwhile catch but to instruct. His sense of humor and easygoing attitude are beneficial to a very productive and enjoyable experience on the river for his clients. Currently, Brown fishes the private fly-fishing only waters along Reeder Creek Ranch, a family-operated working ranch located on the upper Colorado between the towns of Kremmling and Parshall. Kremmling is where the unique rock formation known as the Kremmling Cliffs lie. There's white water rafting in the canyons nearby during the summer. The area comprised of towering peaks, wildflower-covered meadows and pine forests is known as "classic old west." 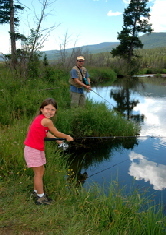 The area is also known for backcountry adventures and fly fishing. In fact, the 20 mile stretch of the Colorado east of Kremmling has been designated as "Gold metal Waters" by the Colorado Wildlife Commission, because it offers some of the best fly-fishing in the state. "We have about a mile and 3/4 of private access to the Colorado River where we typical catch 15 to 20 trout a day," he says. "A typical fish might be a 13 inch brown trout and the exceptional fish might be a 25 inch rainbow. There's a very solid population of brown trout that run 13 to 16 inches in length." 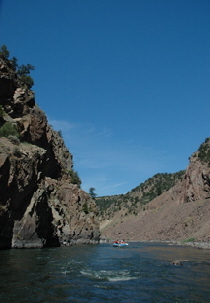 On the Colorado there is quite a variety of terrain ranging from fast-moving riffles to long flats and runs, and large gathering pools. The upper stretch of the river has a lot of gradient to it. There are pools with depths down to 6 or 8 feet and an abundance of large, cannon ball-size brown rock, which creates an excellent habitat for a variety of trout. "Further down on the property, you have more erosion," he says, "and that means you have more of a silted bottom. There is still a solid population of fish in the area, but the flies are different; caddis and golden stoneflies predominant the lower area. The fish there are more predacious along the banks also." "In the river, the fish seem to inhabit areas around shelf drop-offs," Brown explains, "So the areas we key in on have a lot of structure where you'll see a break in the current as the bottom drops from one foot to 3 or 4. Those zones tend to harbor our greatest concentrations of fish. Regardless, there are some opportunities with a heavy hatch that the fish will forego the need to stay in a sheltered area. Then, they'll move into the flat water where you can have lots of fun." "You need to target the rise forms and match the hatch with dry flies then," he continues. "September is when we get our best hatch of blue wing olive mayflies and the fishing peaks then. That's our best chances of dry fly opportunities. We have lots of anioiads in our system, so flies like epoxy-back blue wing Olive mayflies, aquatic worms and caddis patterns are effective most of the summer." "We use 9-foot, 5-weight Sage rods and streamers in the summer and 6-weight later in the season," says Brown. "Ross fly reels are disc drag models. Leaders for nymphing and dry flies are 5X tapered down to a 14-inch long fluorocarbon leader (to a single fly) or a 28 down to the trailer fly if you have a combo setup. We set our strike indicator at no more that 6 feet from the bottom fly when fishing the water depths we normally see here." 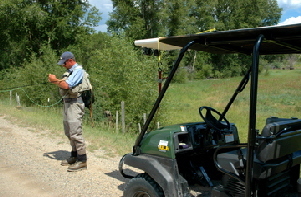 Reeder Creek Ranch provides waders and boots for their clients in addition to carrying the rods and reels above. To move about the property, they use a comfortable four seat 4X4 ATV rig that can climb even the steepest streamside inclines. Trout fishing in the Colorado River area can be an almost year-around activity for locals. There's plenty of action in early spring prior to the runoff which traditionally may be from mid-April through late May, and in the fall from September through mid-October. The summer opportunities are very consistent, according to the guide. Ideally, fly fishermen are looking for water temperatures around 55 degrees and a water flow of around 500 cfs for optimal fishing on this stretch of the Colorado, according to Brown. On my day on the river in August, the water temperature started off about 61 degrees and peaked at around 65. 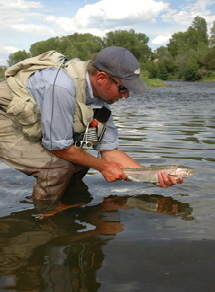 The guide and his clients can normally catch fish on the river in waters up to 68 degrees. After that, fish mortality is much more likely due to the reviving time necessary. The fish have a lot of lactic acid buildup in warmer waters that overstresses them. "In the cold waters of the winter months, the trout tend to group up in tight pods in the deeper holes," says Brown. "They generally respond to smaller midges during that cycle. In warm water, say 65 degrees and up, the fish will move into the faster water where there is more oxygenation. Oxygenation for fish is the equivalent of air conditioning for us. More oxygen in high water temperatures will help fish energy levels." "The biggest variable in May and/or early June is our runoff, and we try to let potential clients know what water clarity, temperature and flow rates may be," says Brown. "We'll cancel if the opportunity is not good." "The runoff will usually push fish toward the banks, and that coincides with very low clarity," he says. "You'll have to throw bigger and brighter, more attractive kind of patterns that are impressionistic rather than realistic to get their attention. If the clarity is only a foot or so, you almost have to hit the fish in the head to get their attention. You just have to be much more intense and methodical in how you pursue them in a small piece of water. You can't just go through it quickly." With the two reservoirs upstream, the irrigation pumping cycles are variables that Brown and the other area guides also deal with. Pumping from those holding waters depending on demand will diminish the amount of water to be released out of the reservoirs into the river. In August, with all the irrigation needs (draw), the river usually experiences its lowest water flows of the season, somewhere around 300 cfs (cubic feet per second). This great trout fishing experience on the Colorado River lies in western Grand County, perhaps the most beautiful county in the Rockies. The county, just 70 miles west of Denver on the western side of the Continental Divide, also offers sportsmen the scenic Rocky Mountain National Park and its Trail Ridge Road, the highest fully paved road in the US. It also boasts (and rightly so) of quaint Grand Lake in the northeast corner and the popular and beautiful Winter Park/Fraser Ski area in the southeast corner. Granby and Shadow Mountain reservoirs tucked into stunning settings, lie between the two areas. Whether you spend all your time wading the riffles of the Colorado or just a day, you'll be rewarded with fond memories. Remember to keep your strike indicator dry and your streamer flies on the move. Then you'll need to keep your rod high!